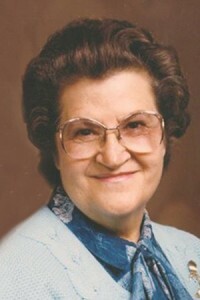 Illa Janett Munro Barger Bigelow was born Jan. 21, 1925, at Eight Mile Road, Soda Springs, Idaho. She passed away with family by her side on Saturday, Sept. 8, 2018, in North Logan, Utah. Illa was raised in Soda Springs, Idaho. She married Zenn George Barger on Nov. 15, 1943. They were blessed with a son, Wayne Ray Barger. Zenn later passed away on Dec. 11, 1955. Illa went back to school and graduated from Utah State University with a Bachelor’s degree in education. She taught school in Tooele, Utah, for 30 years. She married Harold Glen Bigelow on Aug. 13, 1965 and he passed away on Feb. 5, 1999. Illa enjoyed quilting, sewing, needlework and crocheting. She also enjoyed spending time with her family and her grandkids. Illa and Hal traveled all over with Good Sams Club. Illa is preceded in death by her parents, Orren and Janett Munro; brothers, Otto Munro, Wilburn Munro, Wilford Munro, Forriest Munro, Harold Munro and Dorian Munro. She is survived by sister, Mary Elizabeth Munro Aina; her son, Wayne Ray Barger (Joan); grandchildren, Lee Barger, Glenna Lawerence (Jeff), Megan Burnham, Wendy Barger and Zenn Barger; great-grandchildren, Joseph Barger, Jason Barger (Sara), BrieAnne Barger, Desirae Burnham, and Krisondra Burnham; and great-great-granddaughter, Emma Rose Barger. A viewing and family visit will be held at 11 a.m. and funeral service at 12 p.m. Saturday, Sept. 15, 2018, in Soda Springs, Idaho, at the Bailey Creek Church 5th Ward, 361 S. 300 East. In lieu of flowers, the family asks instead for donations to the Alzheimer’s Foundation of America. Condolences and memories can be shared with the family by visiting www.simsfh.com.